The history of LED date backs to 1907 when Captain Henry Joseph observed the property of electro-luminescence in Silicon Carbide. The first LED was designed in 1962. It was developed by Holonyak worked at General Electric (GE). It was a GaAsP device. The first commercial version of LED came in the market during 1960s. LED industry became a boom during 1970s with the introduction of Gallium Aluminium Arsenide (GaAlAs). These LEDs are high bright types and are many times brighter than the old diffused types. Blue and White LEDs was introduced in 1990 which uses Indium Gallium Nitride (InGaN) as the semiconductor. White LED contains a blue chip with white inorganic Phosphor. When blue light strikes the phosphor, it emits white light. 1. LEDs are encapsulated in plastic or resin cases so that they can withstand mechanical shocks. 2. Unlike bulbs, LEDs do not generate heat and power loss through heating is practically nil. 3. LEDs require very low current and voltage typically 20 milliampere current and 1.8 volts. So these are ideal in battery operated circuits. Inside the casing of an LED, there are two terminal posts connected by a small chip made of Gallium compound. This material exhibits the property of photon emission when the p-n junction is forward biased. Different colours are produced by dopping the base material with other substances. The luminous flux covering a large area is the luminous intensity. It is measured as Candela (cd) or milli candela (mcd) Brightness of LED is directly related to its luminous intensity. It is the emitted light energy relative to the input power. It is measured in terms of lumen per watt (lm w). Forward current, forward voltage, Viewing angle and Speed of response are the factors affecting the brightness and performance of LEDs. Forward current ( IF ) is the current flowing through the LED when it is forward biased and it should be restricted to 10 to 30 milli amperes other wise LED will be destroyed. Forward voltage (Vf) is the voltage drop across the LED when it conducts. The forward voltage drop range from 1.8 V to 2.6 Volts in ordinary LEDs but in Blue and White it will go up to 5 volts. Speed of response represents how fast an LED is switched on and off. This is an important factor if LEDs are used in communication systems. The LED has a semiconductor chip placed in its centre. The semiconductor consists of two regions namely a P region that has positive charge carriers and an N region with negative charge carriers. There are three layers in the chip. An active photon generating material is sandwiched between the P and N type materials so that photons will be generated when the electrons and holes combines. That is when a potential difference is applied between the P and N materials through the LED terminals, holes from the P layer and electrons from the N layer move towards the active material where they combine to produce the light though the phenomenon of Electroluminescence. 8. Ultraviolet LED – Indium gallium nitride, Aluminium gallium nitride. -1.6×10-19 joule. The forward voltage of LED range from 1.8 to 3.6 volts in different types. Therefore the energy of emission can be calculated using the formula E=qV. q is the electric charge of electron and V is the forward voltage drop of LED. 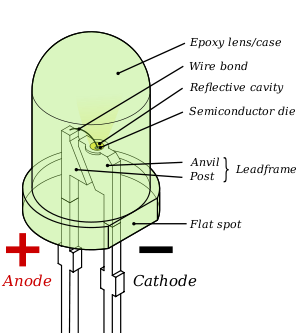 LED is a current dependent device. Minimum 20 mA current is required to get sufficient brightness. If excess current is flowing through the LED, its semiconductor heats up and gradually deteriorate. This leads to poor performance and finally LED will be destroyed. Wattage of the LED is the forward voltage multiplied by the forward current. In high current LEDs, forward current can go up to 350 mA. In these devices the wattage depends on the forward voltage drop ranging from 1.8 volts to 4 volts. Therefore an average of 1 watt is found in high current LEDs. Light from the LED depends on the material used and the amount of current flowing through it. Luminous intensity of LED depends on the current flowing through it. Typical LED requires minimum 20 mA current to give sufficient brightness. Some semiconductor material is affected by temperature. High power Red and Orange LEDs suffer light loss at high temperature. The light output and viewing angle of LED depends on the semiconductor as well as the epoxy casing of LED. LED with high luminous intensity will have narrow viewing angle because light rays will concentrate into a beam. Diffused LED will scatter light so that intensity will be less. How many years an LED live? LEDs have more life when compared to ordinary bulb. The life of LED depends on the physical parameters and operating current. When the light from the LED reduces to half, it indicates its degradation. High quality LEDs can operate more than 1 lakh hours but ordinary LEDs will not live more than 50,000 hours. Is LED requires a Ballast resistor? LED is always connected to the power supply through a series resistor. This resistor is called as” Ballast resistor” which protects LED from damage due to excess current. It regulates the forward current to the LED to a safer limit and protects it from burning. Value of the resistor determines the forward current and hence the brightness of LED. The simple equation Vs – Vf / If is used to select the resistor value. Vs represent input voltage of the circuit, Vf the forward voltage drop of LED and If, the allowable current through the LED. The resulting value will be in Ohms. It is better to restrict the current to a safer limit of 20 mA. There is no semiconductor material that emits pure white light. White light is a feeling created by the mixing of the primary colors – Red, Green and Blue. The white LED has an Indium gallium nitride blue chip coated with phosphor. This phosphor can emit white light when energized with blue or ultraviolet photons. The blue light emitting chip in the LED is coated with a converter material. When this converter material is activated by blue light, it emits yellow light. The mixture of blue and yellow light is perceived by the eye as white light. The light from the white LED has both peaks in the blue and yellow region but human eye will identify the peaks as white light. That is why, some white LEDs looks more blue and some more yellow. This is due to the difference in the peaks. White LED requires minimum 3 volts for its operation and its forward current can go up to 40 mA. LED technology is advancing and the latest potential devices include High power white LEDs, Lattice LEDs, LED monitors etc. High power LEDs can give more than 1000 lumens and the device is brighter than a 50 watts halogen lamp. These LEDs are widely used to make flood lights, room lights and also in display purpose. Lattice LED is the new generation LED using the photon lattice technology. Large area chip is constructed using the lattice method. These ultra high power LED lattice can operate at an input power as high as 100 watts. Lattice LED are used in sign boards, display devices , LED TV etc. An LED that can give different colours is useful in some applications. For example, an LED could indicate all systems OK when it becomes Green and faulty if it becomes Red. LEDs that can produce two colours are called Bicolour LEDs. A bicolour LED encloses two LEDs (usually Red and Green) in a common package. The two chips are mounted on two terminal posts so that the anode of one LED forms the cathode of the other. Bicolour LED gives Red colour if current passes in one direction and turns Green when the direction of current is reversed. Tricolour and multicolour LEDs are also available which have two or more chips enclosed in a common package. The Tricolour LED has two anodes for red and green chips and a common cathode. So it emits red and green colours depending on the anode that carries current. If both the anodes are connected to positive, both the LEDs lights and yellow colour is produced. Common anode and separate cathode type LEDs are also available. Bicolour LED glows in different colours ranging from green through yellow orange and red based on the current flowing through their anodes by selecting suitable series resistor to restrict anode current. Multicolor LED contains more than two chips-usually red, green and blue chips- within a single package. Flashing type multicolor LEDs are now available with two leads. This gives a rainbow colour display which is highly attractive.